Vassar College (/ËˆvÃ¦sÉ™r/ VASS-É™r) is a private, coeducational, liberal arts college in the town of Poughkeepsie, New York, in the United States. Founded in 1861 by Matthew Vassar, it was the first degree-granting institution of higher education for women in the United States. It became coeducational in 1969, and now has a gender ratio at the national average. 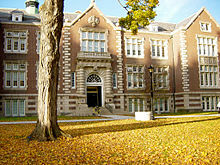 The school is one of the historic Seven Sisters, the first elite female colleges in the US, and has historic relationship with Yale University, which suggested a merger with the college before coeducation at both institutions. The college offers B.A. degrees in more than 50 majors and features a flexible curriculum designed to promote a breadth of studies. Vassar also offers many extracurricular organizations including student theater, a cappella groups, club sports, volunteer and service groups, and a circus troupe. Vassar College's varsity sports teams, known as the Brewers, play in the NCAA's Division III as members of the Liberty League. Vassar tied for the 12th best liberal arts college in the nation in the 2016 annual ranking of U.S. News & World Report, with an admission threshold described as "most selective." As of 2015, the college had an acceptance rate of 25.7%. The total number of students attending the college is around 2,450. 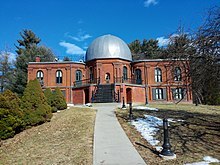 Vassar was founded as a women's school under the name Vassar Female College in 1861. Quickly thereafter its founder, Matthew Vassar, had the word Female cut from the name, prompting some residents of the town of Poughkeepsie, New York to quip that its founder believed it might one day admit male students. The college became coeducational in 1969. What are the academic rankings for Vassar College? 2. number 177 for ROI (Return on Investment). What universities are similar to Vassar College?